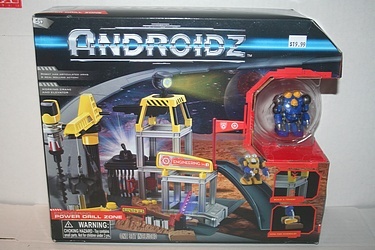 When I first noticed that toysrus.com had the entire Androidz line in stock and ready to ship, including a classic carrying case, I did some quick math and saw the pricetag for picking up the full set was a little steep. Well, as usual I wasn't paying enough attention, and what I initially saw as $29.99 'large playsets' are actually the $19.99 'small playsets' with the team vehicle and two bonus robots packed into a TRU exclusive box. Now, of course I think that's awesome, and it's a good value too with at least a few extra robots for free, but at least it means those large sets are not unique pieces. While I am disappointed to learn that there isn't the huge variety of items that I initially thought, it does make the line a little more manageable and thoughts of picking it up a little more reasonable. Remember that the playsets are packed with features, and each even provides a 'garage' for the team vehicle! By way of example, here is the Power Drill Zone for the Engineering Division team! This 'small' version of the set includes one robot (Angle Grinder) as well as a working crane and elevator, robot escape ramp, working freight elevator and all sorts of other stuff. I continue to dig this line, and am looking forward to setting up this set and seeing how well the robotic wheeled warriors interact with the various components. This line is likely to entirely evaporate as soon as stocks sell through, so if you think they are cool don't waste any time - do your holiday shopping early! Oh, and if there is any lingering confusion as to why I'm so crazy about this line, just look at how well the colors of the Power Drill Zone fit in with the rest of the Preserve front page!